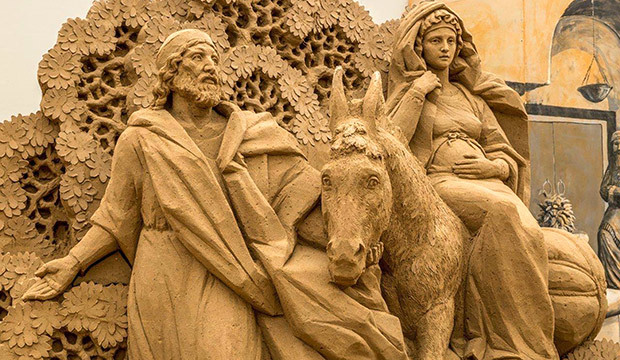 According to the Vatican newspaper, L'Osservatore Romano, the Nativity scene displayed in St. Peter's Square will feature a 52-foot wide sand sculpture from Jesolo, an Italian seaside resort town roughly 40 miles north of Venice. The intricate sculpture, along with a 42-foot-tall red spruce tree donated by the Diocese of Concordia-Pordenone in the northern Italian region of Veneto, will be unveiled at the Vatican's annual tree lighting ceremony Dec. 7. Bas-relief sand sculptures, like the one that will be featured in St. Peter's Square, are a tradition in Jesolo which, since 1998, has been the home of an annual sand sculpture festival. At the helm of the sculpture project, dubbed the "Sand Nativity," is U.S. sculptor Rich Varano from New Smyrna Beach, Florida. 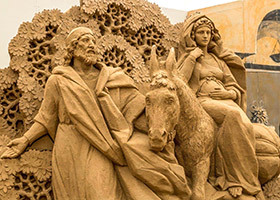 According to the city's website for the Nativity scene, Varano is an accomplished sand sculptor with over 40 years' experience and has organized various international sand sculpture festivals, including the annual event in Jesolo. Varano is joined by 11 artists from around the world, including Damon Farmer from Kentucky and Canadian artist David Ducharme, who are assisting in creating the massive "Sand Nativity" before its December unveiling. The "Sand Nativity" scene and tree will remain in St. Peter's Square until the feast of the Lord's Baptism Jan. 13, L'Osservatore Romano reported.